We are big supporters of the 50/50 On the Water Campaign to empower more women to participate in the sport of fly fishing. We have created Fly Gals Weekend to achieve just that. The class is geared towards women who are interested in learning about fly fishing, specifically those who are just beginning or have never before fly fished. The class teaches students the basic mechanics of fly casting, knot tying, entomology, conservation, river etiquette, fly tying, and essential gear and tackle. Details: We are super excited to bring back our second annual Women's Fly Fishing Clinic! We have an amazing line up of instructors from all over Southern California to teach the class. Classes will be held at Mountain and River Adventures. The day begins with a fun and easy yoga class designed to fire up those fly fishing muscles followed by classes in casting, entomology, fly tying, conservation, knots, and gear and tackle. The day ends with a lively Pint Night at Kern River Brewing. Lunch is included in the class. You are welcome to bring a yoga mat or a towel, but not required. Please bring water shoes or wading boots as we will be on the river for the casting class. Click form below to sign up. Please fill out the comments section if you have any questions regarding the event. Details: This is an excellent opportunity to apply your newly learned classroom knowledge with actual time on the water. You will be fly fishing the Kern River with one of our club members or instructors from the previous day. This will immediately reinforce everything you learned in class. You’ll also learn how to read the water for likely spots in the river holding fish. This mentor class is also open to Women's Class participant's family members and their significant others. A valid California fishing license is required. Please bring your own fly fishing gear, if you haveone. If not, equipment rentals are available at the Fly Shop. Celine is your typical millennial from Los Angeles who quit her job as a graphic designer at American Apparel to learn more about fly fishing. Having traded her hipster huaraches for wading boots since moving to Kernville, you can probably catch her on the river yelling curses at missed hook-sets or having a rap battle dance off with her fly ladies. When she isn't making a ruckus on the river or working out of her home office, Celine works on local conservation projects with Keepers of the Kern and the US Forest Service. She is also part of Kern River Conservancy's Wild Trout Conservation Outreach Team. Celine is currently apprenticing to be a guide with Kern River Fly Shop and is also working on getting more women introduced to fly fishing through Southern Sierra Fly Fishers' Women's Fly Fishing Clinic. Connie often heard phrases like ‘you don’t look like you would be a fishermen’ or ‘how did you get into fly fishing?’ Back in 1996 she was in a relationship that exposed her to fly fishing. Back then, the women that were seen on the streams were usually seen sitting on the bank or in the car reading a book. Connie, however, could not take her eyes off the grace and beauty of the casting and the hook was set for learning more about fly fishing. She joined Long Beach Casting Club and found a mentor. Moving back to her roots in Valencia, she started the Santa Clarita Casting Club and became the secretary for FFI Southwest Council. The rest, as they say, is history and what a wonderful adventure it has been for Connie. Geneva (like the convention) received her yoga instructor certification in 2014 through Happy-U Namaste in Ocean Beach, CA. She is a compassionate ER RN with over 10 years of medical experience, integrating her deep knowledge and understanding of healthcare and how the human body works into her yoga instruction. Finding strength and self-confidence through rock climbing, whitewater rafting, yoga and the outdoors in general, she recognizes the importance of empowering people to be active participants in their own health, wellbeing and happiness. Co-founder of The Outside Way, Geneva currently teaches yoga by donation for all levels at Riverside Park in Kernville. Kesley has been fly fishing since she was 10 years old. Her earliest fly fishing experiences were with her dad who chased puddle-bound brook trout in the Appalachians. Although she enjoyed trout, she quickly discovered she loved the challenge of fly fishing for anything that swims. Since those days, she has traveled to such places as Labrador for [much larger] brook trout, the Bahamas and Hawaii for bonefish, Louisiana for trophy redfish, Belize and the Yucatan for permit, Phoenix for grass carp, and Costa Rica for big tarpon. Kesley has eight IGFA records on fly thus far and also enjoys competing in tournaments such as the Ladies Tarpon Fly Tournament in Islamorada, Florida. Kesley currently works for Amgen in Thousand Oaks, CA, in regulatory affairs. Amy Kileen got her start on fly fishing at a young age while prospecting for gold with her dad along the California-Nevada border. It's no surprise that she chose this location for her recent retirement from teaching in California. Amy has served as president of the Kern River Fly Fishers in Bakersfield and is an active member of Southern Sierra Fly Fishers in Kernville. 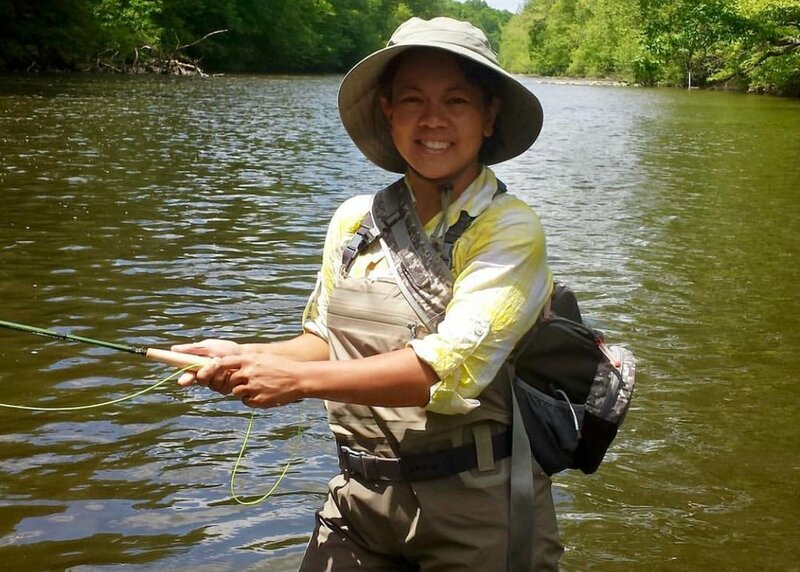 Her past experience as a ten year Trout in the Classroom teacher has helped her connect with different age groups. She has since become an Angling Education volunteer for the Nevada Department of Wildlife. Amy has recently orchestrated the Women's FF Clinic in Gardnerville, NV and has a Bronze Award in Fly Tying from FFI. Carole’s earliest memories of fishing start at the family Cabin on Echo Lake. The annual family summer escape to the lake provided lots of fishing. Her progression was much the standard, day hikes to fish, longer trips with family and friends. Her most recent involvement with CASTING FOR RECOVERY, has brought her to fly fishing. Her extensive volunteering with CFR has given her many memorable fishing adventures and has helped forge life long friendships. Her need to share the joy of fly fishing with others and to just, “Get Toes In The Water” has lead her on a whirlwind of fly fishing adventures the past 3 years. These days you will find her on some beach, “Toes In The Water” crouched down in the sand, casting to that elusive (so far) Gray Ghost. Maria E. Rivas has followed her passion for fly fishing for thirty years. Her experience with fishing encompasses, from the beginning, conventional fishing that soon evolved into the fly fishing fly tying and travel. It was here that her passion for fly fishing consumed any free moment, from work and family, pursuing knowledge in fly casting, fly tying and of course fly fishing. Maria’s passion for the sport took her on some adventures to Alaska, Montana, Wyoming, Utah, and far away places like Chile and Christmas Island. Maria’s passion is best described by her motto, “Fish are never promised by the waters we love. It is the friendships we nurture, the adventure we embark upon and the hunt that provides the thrill in our hearts and the peace in our souls” (MER). Maria is a member of the Long Beach Casting club and has has 29 years of fly tying and demonstration fly tying. Leigh Ann Swanson has fly casting in her genes. She is a third-generation fly fisherman whose grandfather was a champion fly caster. Leigh Ann is a member of Winston Pro Staff, a FFI Certified Casting Instructor and a graduate of the Joan Wulff Fly Fishing School for Instructors. Leigh Ann has been a professional guide in Wyoming and enjoys sharing her passion for fly fishing and casting with children and adults of all ages. She developed numerous casting programs for the Pasadena Casting Club, where she served as casting director for six years. In 2012 Leigh Ann was awarded the Pasadena Casting Club’s Pauline Cathcart Memorial Casting Award in recognition of her enduring commitment to mastering and teaching fly-casting. Contact Mountain and River Adventures at 760-376-6553 for a special discounted rate on camping accommodations. Contact Sequoia Lodge at 760-376-2535 for hotel accommodations. Contact Kern Lodge at (760) 376-2223 for hotel accommodations.